Looking for a comfortable alternative to the formal dining room? Gather your family together in one of our unique, solid wood corner nook sets for a more casual and intimate setting for dining together. Dining room tables are important - they are where we break bread together, catch up on one another's lives, nourish ourselves and give thanks. 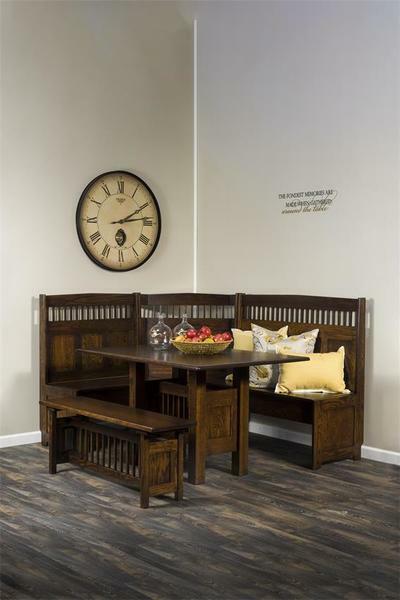 Why not make your family's dining experience a special one - around a solid wood, American made, authentic Mission corner nook set? This breakfast nook can be custom stain matched to your kitchen counters or existing dining room furniture which will unify the flow of your rooms. The flat panel backs with the small spindles gives this Amish corner nook set a authentic Mission style. Call one of our Amish furniture specialists to split the nook set up or to customize the dimensions or look. Minor assembly is required for the corner breakfast nook set. With storage space within each bench, our corner nook sets are practical space-savers. Tucked neatly into a corner, either a left-facing or right-facing, a solid wood corner nook can be a unique, practical and fun way to transform dinner time. Our corner nook sets are available in your choice of oak, cherry, brown maple, quarter sawn oak, hickory or maple wood. Select from a variety of stain and paint options to get just the right touch of personalization for your home. The Amish craftsmanship that goes into this corner nook is unmistakeably superior. The Amish build furniture with integrity, taking care to give their best in all details of workmanship for honest, durable, beautiful furniture. With gorgeous and durable finishing and specialized packing and shipping, your corner nook will soon be ready to enjoy! Please visit DutchCrafters furniture store in Sarasota, Florida or call to speak with a furniture specialist to discuss customization, ask questions, get stain samples or to place your order with a friendly, helpful live person! Display drawer is highlight of table. Quality is excellent. It is being used in my kitchen as a breakfast nook.